More of the massacre. 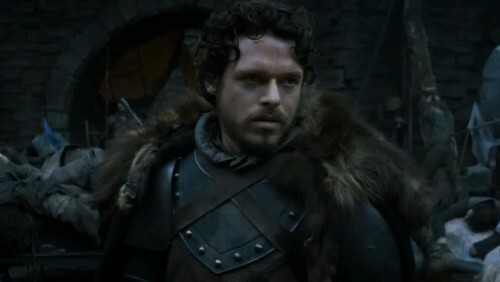 Note the body to the right of Robb, behind him—it looks like his hands were tied to the post before he was run through with a spear. This definitely seems to be the murder of prisoners at Harrenhal, either representing what Gregor Clegane left behind before he abandons the castle to the Starks or perhaps what Robb’s own men have done in his name.